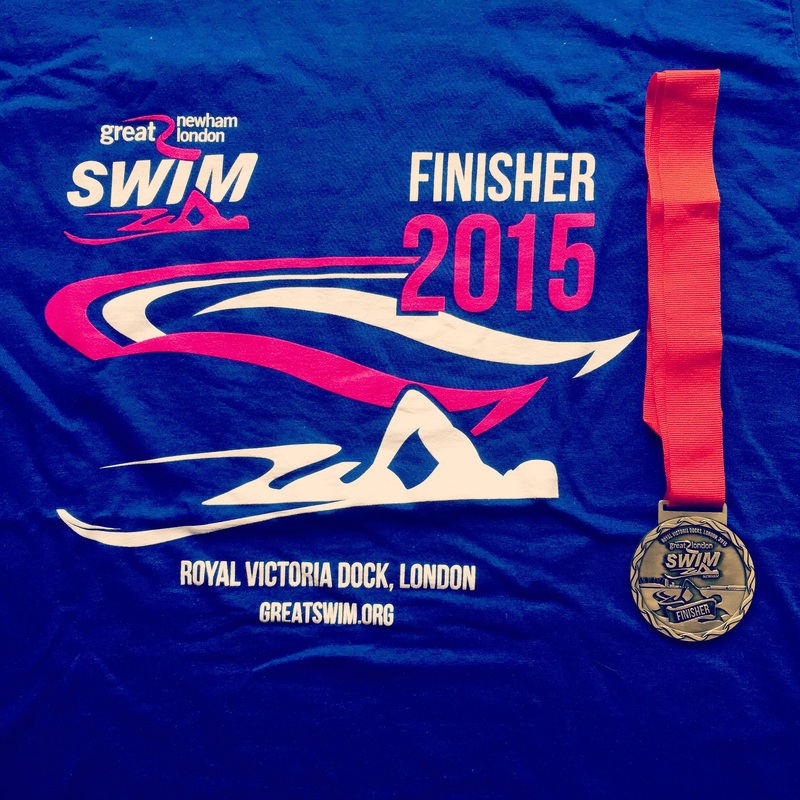 On 18th July 2015, Manda and Katie took part in the Great London Swim. The swim is in the Royal Victoria Docks out by the ExCel centre in East London. It has been four years since we last raced on this ‘home’ course. Back then one mile felt like a long race but now it is definitely considered to be a sprint! The day started at 9.30am with a family half mile wave followed by 11 one mile waves. Manda and I opted for the 3pm wave on the basis that most people would prefer to swim earlier in the day and therefore this wave should be less crowded. We were right and there was only about 30 people in this final wave of the day. The course is a big rectangle very clearly marked with buoys around every 200m. I really liked this as it gave you a good idea of progress and had meant that I planned to sprint the last 200m but was just too tired! At the start of the swim if felt like there was a strong current pushing you to the side. This calmed down once you hit the top right corner and was pretty calm along the straight. I had to stop dead twice though to adjust my hat which kept on falling off! When you turned back towards the docks at the end of the straight there was quite a wind which made for choppy progress and the second half was slower going than the first. Manda finished in 25m 18s and was third female and 18th overall – well done Manda! Although I think she was a bit disappointed after having gone a minute faster in skins the week before at the lido. I was pleased with my 26m 24s, and 8th female and 34th overall place though. Pivo also competed in an earlier wave and finished in 26m 25s. Overall a whopping 1,052 people took part in the event – a lot of people taking part for the first time. As ever the Great London Swim was professional and slickly organised. The event is good value for money and you get a cool goody bag including a t-shirt. It is also nice to not have to get up at the crack of dawn to race and to be able to take the tube! A special mention goes to Manda’s husband, Dom’s mum, Sarah, for watching Max for me while I swam – thank you!